WB No. 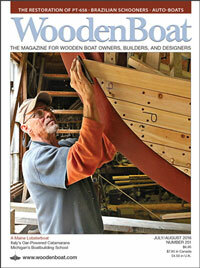 229: — In the Getting Started in Boats supplement, we presented basic instructions on varnishing. 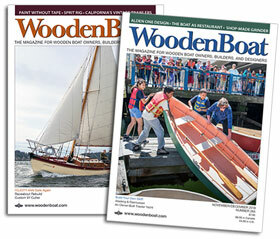 That article included a discussion of varnish brush care, which inspired contributing editor Maynard Bray to tell us about a simple technique he’s used for years for maintaining badger-hair brushes. In the following words and photos, Maynard shares that technique. —Eds. Storage is in the smallest can that the brush will fit into. For a 1 1/2″ brush, a B&M baked bean can is just right. The oil level has to be kept above the bristles always, and this means an occasional topping off. A baggie slipped over the top keeps out the dust. Be sure to use raw, not boiled, oil, as the latter will skin over and contaminate the brush. put it back in the keeper oil and cover the whole thing with a baggie to keep out the dust. 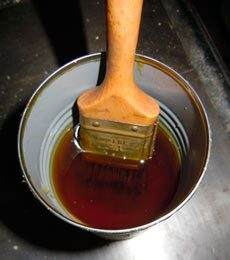 If your varnish brush is the usual short-bristle badger-hair type, it is sufficiently stiff to stand on end in the oil without any other support. It just leans against the side of the baked bean can and almost floats there without bending over the brush’s working end. 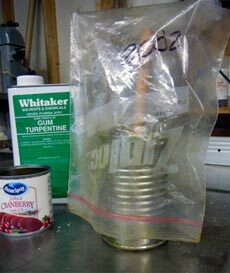 For fun, I date the baggies; I’m still using the brush (and baggie) from 2002. A decade with the same brush, preserved this way in raw linseed oil, isn’t bad going—and it’s a much faster method than drying out your brush each time you use it. I think I may have changed my keeper oil three or four times during this ten-year period.